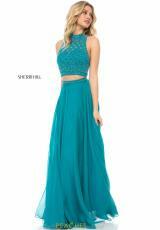 One of our favorite Sherri Hill prom dresses, this two piece style 51724 is the perfect choice for your senior prom. Enchanting dress showcases a high neckline with the fully adorned in stunning bead work bodice and a breathtaking cut out open back. An embellished belt clinches at the waistline while featuring a lovely chiffon skirt flowing out perfectly.